Windows give spaces an open, airy feeling and can tie rooms together with their various styles and color schemes. How you choose to decorate a window gives life and flair to the rest of your space. Ever wonder what’s in style right now? Well, let’s take a look at four of the top window treatment trends so far in 2016. Technology brings a lot of unique options into the housing world. Nowadays, you can control objects such as ceiling fans and lights with the simple push of a button on a remote control. Another area technology is venturing into is blinds and window treatments. According to an article published on Angie’s List, motorized shades are one of this year’s exciting new home trends. 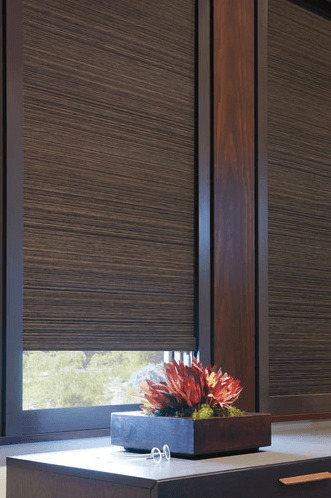 Motorized shades take the functionality of window treatments to the next level, allowing you to operate your shades remotely using a smartphone or to schedule your shades to open and close at specific times. Boca Blinds offers motorized shades in exquisite designs, fabrics, colors and textures, all with superior operating systems. Decoration trends are slowly returning to natural woods and textures, giving the home a more green-friendly, ecological touch. According to HGTV, organic materials make the list of some of the more popular trends for 2016. Natural woven shades in subtle woods like sustainable bamboo let in diffused light to allow you to see outdoors while offering just enough privacy in your home. Woven wood blinds from Boca Blinds are made of natural reeds, bamboo, grasses and other woods that transform sunlight in a whole new way. Available in vertical and horizontal styles, these blinds are sure to look great in your home. Another popular trend noted by Angie’s List is architectural features like shutters. A streamlined shape, rich finishes, and understated fabric choices allow you to add some architectural detail to any room in your home. The article also mentioned that installing shutters could give you some architectural detail around your windows to achieve a more modern and ornate look. Boca Blinds once again has you covered here with our plantation shutters, a traditional décor option crafted from premium hardwoods and durable MDF composite. You have many options with these shutters, including designer frames and sliding door systems of any shape, all offered in numerous colors. Adding some shutters to your windows will give you a nice, solid frame for any space. A room’s color scheme is what ties everything together, from the colors of the walls and furniture to the drapes and rugs. HGTV has listed some popular color trends for this year, which includes blues (ocean hues, teals and soft greens in particular), soft lavender and grays, oranges, gold and browns. No matter which scheme you choose, Boca Blinds offers the variety you seek. Draperies and soft treatments by Boca Blinds help you beautify your space with side panels and board-mounted upholstered cornices. Check out our wide range of fabric selections and drapery rods to make your home look great and stay current with the latest trends. Shop our full inventory online now, or call Boca Blinds at 561-368-5322 to request a free in-home estimate today.